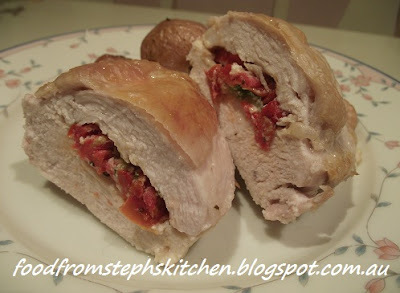 I made this stuffed chicken recipe for dinner yesterday and it was great! I then had that moment of "Oh, I'll have to put this on my blog" ... then followed the usual thought of 'why can't I measure what I'm doing BEFORE I think I'll add this', because I don't know about you but I am terrible and don't measure anything when I'm just cooking for myself. So this recipe will be a little basic but it is really easy that you almost don't need a recipe! One chicken breast with the skin on for each person you are cooking for. Simply cut a pocket in the middle of the chicken breast, making sure you only cut on the one side and don't cut through. In the pocket lay out around 6-8 semi-dried tomatoes, depending on the size of the chicken breast, followed by the cheese. Arrange the basil leaves on top of the cheese. If you don't have fresh basil you can simply sprinkle a little dried basil inside the pocket. Using toothpicks pin down the sides of chicken to close off the pocket - the more secure the better so that you don't lose your cheese! Cook skin side up in an 180°C oven for 30-40 mins depending on the size of the chicken breasts, until the chicken is cooked through. I served this with some roast vegetables and (with me having this need for sauce of some kind) a creamy garlic sauce.